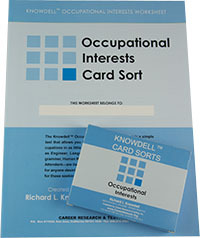 A low-cost and fast technique for quickly identifying and ranking occupational interests. Each deck comes with one worksheet. Extra worksheets can be purchased separately. Optional manual includes guidelines for counselors and group facilitators, an overview of interests and their role in career decision making, detailed instructions for the individual user and optional activities for clarifying career-related interests.